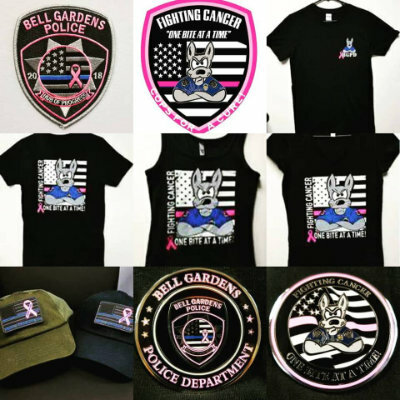 Bell Gardens Police Officers' Association is participating in the Pink Patch Project during the month of October. As part of this initiative, BGPOA is selling their pink patches directly to the community for $10 each. All the proceeds will be donated to support cancer research and treatment. Along with patches we are also have for purchase: Challenge Coins ($15), Magnets ($10), Stickers ($5), T-shirts/ Ladies Tanks/V-Necks ($20) and Adjustable Hats ($15).